[Xerte-dev] Re: Did something change to break the misc >	flickr	page at	some point? Previous message: [Xerte-dev] Re: Did something change to break the misc >	flickr	page at	some point? Next message: [Xerte-dev] Re: Did something change to break the misc	>	flickr	page at	some point? The same thing may have happened with the randomize answers code that was referred to in a previous query. e.g. 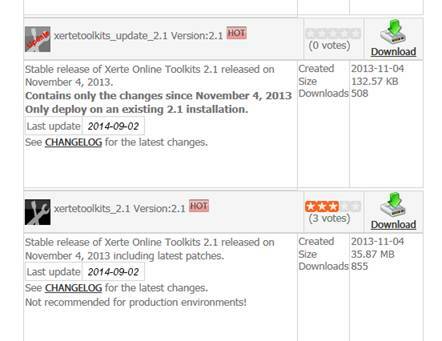 last update to those downloads show as 2014-09-02 not sure if that's 2nd Sept or 9th Feb? The fix is in the unstable download but obviously that's not recommended for production use. Lost track now of where and what we should point people to for downloading a stable version? Subject: [Xerte-dev] Re: Did something change to break the misc > flickr page at some point? Subject: [Xerte-dev] Did something change to break the misc > flickr page at some point? If I view the page types demo from the Nottingham install http://www.nottingham.ac.uk/toolkits/play_8203?&page=45 that still works but I've now tested this on too many servers (including one of Tom & Inge's installs) for it to be a server specific issue so I'm wondering if it's due to a code change somewhere at some point? Or perhaps it's a change at the Flickr end but only affecting later revisions?